As the temperature climbs, Arizona’s utilities keep investing in fossil fuels that exacerbate climate change and present cost risks to customers. The heat wave that struck the U.S. Southwest during the third week of June 2017 broke hundreds of records across the region, including one day in Phoenix, Arizona where the thermometer hit 119, part of nearly a week straight of temperatures exceeding 115 in the region. Another heat wave brought Phoenix back to 118 degrees on July 8, 2017, so that as of July 9, 2017, Phoenix had experienced 4 days over 117. Phoenix currently experiences 110 days per year over 100 degrees Fahrenheit. Phoenix’s last 20 summers have averaged 38 more 100-degree days than 100 years ago. 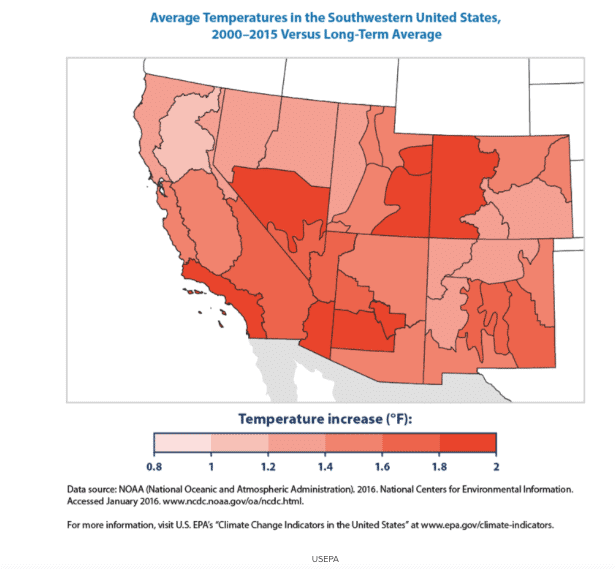 The map from the National Oceanic and Atmospheric Administration (NOAA) below shows that parts of Arizona experienced an average increase of 1.8 to 2 degrees Fahrenheit from 2000 to 2015 as compared to historic averages. While most Phoenix news stations failed to cover the link between climate change and Phoenix’s higher temperatures, the utilities certainly noticed: Arizona’s three largest utilities shattered previous records for electricity use, one by almost 350 MW. All in all, eight utilities across five states saw electricity demand reach new highs. Most of the profits made by Arizona utilities are during the hot summer months, when customers use the most electricity. An environmental economist from the University of California has co-authored a paper projecting widespread increases in peak electricity demand as temperatures continue to soar, with the biggest impacts in the hot, sunny states of Arizona, California, Florida and Texas. The study finds that investing in energy-efficient appliances and developing cheaper batteries can help to lower the costs of meeting additional electricity demand during heat waves. 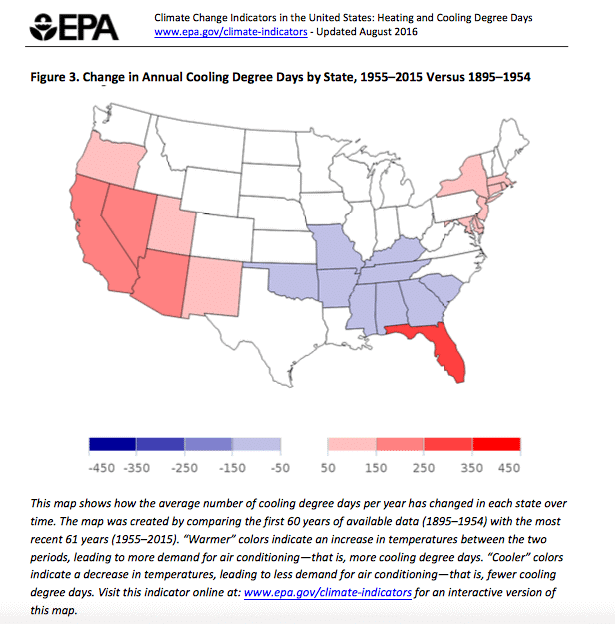 An indicator of how much air conditioning is required is known as ‘cooling degree days,’ and the EPA map below shows how the demand for cooling (air conditioning) in the U.S. has changed over time. The red colors are in states where air conditioning use has increased, and the darker the color, the higher the increase in demand. Arizona is one of a handful of states with a marked increase in the number of cooling degree days. As temperatures continue to increase over the coming decades, the increase in ‘cooling degree days’ will grow, requiring more electricity. Heat waves also mean higher levels of ground-level ozone, increasing risk of heart attack and breathing difficulties. Yet while the effects of climate change hammer Arizona, the state’s utilities continue to invest in fossil fuels, rather than take advantage of the state’s enormous solar potential. Depending on the year, Arizona utilities spend $2 to $3 billion to import fuel for electricity. Arizona’s bill for fossil fuels has been lower recently, but coal and gas are commodities whose prices are difficult to predict, a dynamic that is especially true with gas. Arizona utilities appear to be ignoring the enormous volatility in the cost of natural gas, and the risk to ratepayers posed by fuel costs which may rise in the future, since fuel costs are passed through directly to customers. TEP’s 2017 Integrated Resource Plan proposes to triple TEP’s gas burn by 2032, and considers natural gas storage and reciprocating engines rather than investing in solar options such as concentrated solar power, distributed generation and domestic and commercial-scale solar hot water. APS is no better, with plans to also triple its gas burn by 2032, and invest only marginally in solar. APS, TEP and Salt River Project also appear to be ignoring the climate effects of increasing natural gas use, as scientists raise the alarm that methane is 86 times worse than CO2 over a 20-year period, according to the Intergovernmental Panel on Climate Change. Tucson Electric Power (TEP) recently signed a 20-year Power Purchase Agreement (PPA) for 4.5 cents/kWh solar-plus-storage. Solar PV is perfect for Arizona, generating electricity for an average of 27% of the hours/year (‘capacity factor’) with practically no water use. TEP’s IRP reports that Concentrating Solar Power (CSP or solar thermal electric) with molten salt storage boasts a 50% capacity factor, with 83% of electricity generated by CSP ‘coincident with peak;’ in other words, 83% of the electricity is generated when TEP needs it the most. All Arizona utilities have made little use of solar hot water, and don’t appear to recognize the role that it could play in helping to smooth out the variability of solar PV. According to the Energy Information Administration (EIA), solar contributed 4% to Arizona’s net electricity generation in 2015, with about 25% of the total solar generated from distributed resources. Arizona’s distributed generation is less than not-so-sunny New Jersey and is far behind neighboring California, as reported by the EIA in June 2017. Arizona also has less commercial-scale solar potential than that sunny paradise of Massachusetts. While Arizona’s electricity generation from solar thermal electric nearly doubled from April 2016 to April 2017, it still constitutes a small percentage of overall electricity generation, and is not close to its potential for clean energy generated by the sun. As the Regulatory Assistance Project’s Jim Lazar points out, utilities could take excess solar electricity, generated during the day when Arizona’s sun is blazing, and use it to make ice to aid in cooling later in the day when solar PV output fades. Or customers can use the excess generation to heat water. As Lazar points out, excess generation from solar PV during the day is an opportunity, not a crisis. Utilities have been fighting distributed generation in earnest for the past decade, and Arizona utilities are no exception. Utility analysts at McKinsey report that utilities are attempting to devalue distributed generation by changing rates, adding demand charges, and/or reducing the amount of money paid to customers who generate their own solar electricity. McKinsey estimates that by 2022 it will be cost-effective in Arizona for customers to generate 80-90% of their electricity on site in what it calls a partial grid-defection scenario. According to Bloomberg New Energy Finance, the cost of batteries, along with electric vehicles, is plummeting, and the potential for micro-grids, domestic and commercial solar hot water, white roofs, shading, demand response and energy efficiency to increase the amount of clean energy increases dramatically. All of these resources will only become more important as climate change worsens; if Arizona’s utilities embraced them, they would not only help to reduce carbon pollution, but they would also help their customers better adapt to the increasing burden of cooling homes and buildings as the temperatures continue to break records. Unfortunately, Arizona’s utilities and regulators continue to make poor use of the state’s solar resources, instead continuing to rely on the fossil fuels that are causing the climate crisis in the first place.